I don’t really get why people are obsessing with Disney princesses either. I used to enjoy the movies, and Pixar’s, but then it started to feel like they were turning into every other company: just spitting the films out to make money. Not much of Disney or Pixar’s stuff is worth watching these days. I think about issues like this constantly. I have sons, but I also have two nieces & I come from a family FULL of girls. We need to respect kids for who they are — one day my nieces want to be princesses, the next they want to be pro football players for the Patriots. Some days, my sons want to cook & clean and watch My Little Pony, and some days they want to bat at each other with swords. Kids are fluid and as adults we need to allow them their fluidity. Barbie, Disney, etc, get a lot of blame for the things we as adults do to kids ourselves. And we buy the stuff, so again, we’re ultimately to blame. No, women don’t need weapons to be strong. I agree with that. However, women don’t need to be stripped of weapons to be feminine. That, I think, is the key here. None of the other Disny princesses have weapons, they can all serve as non-warrior role models. Why can’t Merida keep her bow and serve to remind girls that they can be warriors too? I am part of the Society for Creative Anachronism (a medieval recreation/research group). I love dressing up in a pretty dress during court, but my favorite part is putting on armor and fighting. I’ve struggled with the divide society puts between “tomboys” and “pretty girls”. As it turns out, I can be both! Girls should be allowed to pursue whatever interests them – including being a bow or sword wielding princess. P.S. Plate armor actually moves nicely with you when it’s been custom made so that it fits you exactly. (Though I’ve chosen to fight in chain maille, as I like the flow of it better.) For the most part, your plate looks great! However, no fighter I know would for a moment consider fighting in heels. B- I tend to agree with you that people get worked up about Disney stuff more than they need too. Julie- I find I think about these things a fair bit as well. I work with a lot of old books and I tend to talk to them. I find my default is to refer to them as “Little guy” or “Buddy”, both male monickers. I never realized my default position was that inanimate objects were male, rather than female. This was pointed out to me by someone, so now I try to refer to some of them as female, though it’s a hard habit to break. 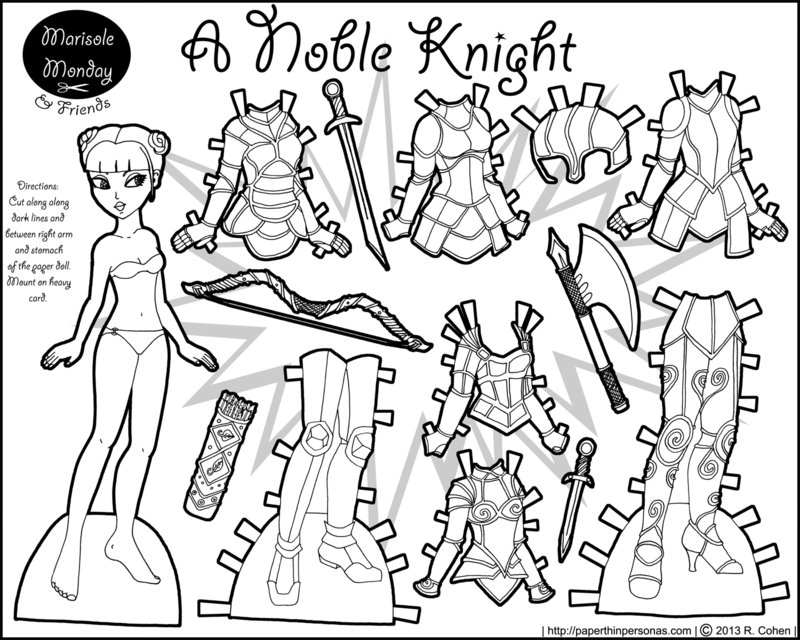 But I agree with you, high heeled full plate armor is up there with the chain mail bikini concept, pretty absurd, but paper dolls are for the absurd. or could you please do a job set instead? doctors,bankers,police and so much more!